If you need cost-effective garden panels that offer a nice blend of security and privacy then be sure to consider this pack of garden fence panels from Forest. Made from FSC certified timber that is pressured treated to avoid rotting, the fence comes with an impressive 15 year guarantee against rot. This gives a good peace of mind that your investment is money well spent and will last for years to come. The panels measure 6ft x 6ft so offer the upmost privacy and security, while vertical battens on each panel offer additional durability and protection from the elements. You don’t even need to treat it each year either, so maintenance is very low. Installation is straight-forward and you can easily paint the panels to suit your outdoor aesthetics. These Waltons Wooden Fencing Panels offer the perfect balance between style and function, so if you want a strong and secure fence that looks great this is one well worth consideration. A combition of timber and cladding, the timber is pressure treated to ensure it lasts for many years, with the manufacturer offering a ten year rot guarantee. Resin present in the timber eliminate moisture builds to ensure water and insects don’t do any lasting damage, so expect it to last for some time. The cladding portions are 8mm thick and offer plenty of privacy while they timber slats are thick and sturdy to offer the upmost security. The top portion features a decorative lattice that really enhances the style of the panels and can be adorned with hanging baskets and other decorative garden accessories. Each panel measures 5’ 11” x 5’ 11” so offers plenty of privacy and security, whether you want to keep prying eyes out or create a safe boundary for children and pets. When it comes to robust but stylish garden fencing, these square panels are a great option, providing a secure yet attractive fencing that will be a fine addition to any outdoor space. Measuring 5’ 11” x 5’ 11”, the square panels provide as much privacy as you need, with the double -sided design ensuring no visibility through either side of the fencing. This also helps reduce any noise pollution, making it a great option for gardens near busy streets or for anyone with noisy neighbours. The edges are smoothed to offer a pleasant aesthetic, while the treated timber is easy to treat and paint if needed, although the natural grains of the timber look great when left untreated. These featheredge garden fence panels from Forest offer the complete package for anyone seeking a sturdy garden fence that provides complete privacy and security. Measuring 6ft x 6ft, nobody will be peering over these panels, while the tapered board design makes them impossible to look through and reduces noise pollution. Two horizontal 45mm battens are attached to each end of the panel for added strength, making it very sturdy against the elements and any accidental collisions, and there is 50mm x 30mm framing around the entire fence. Choosing the right garden fence requires some thought and consideration. With so many fencing options available it’s easy to get overwhelmed by the options, and that’s before you even consider the unique requirements of your garden, so taking the time to think about what you need ensures you get the best garden fence. Modern fencing comes in various styles, materials, and colours, so there is no lack of options when it comes to selecting yours. You also have the choice between classic fence kits where you install everything yourself and the more user-friendly fence panels that make for a much easier installation. Another thing to think about is the purpose of it. While fences offer an obvious function, you may want to think about whether you need it for purely aesthetic reasons or to provide improved privacy and security to an outdoor space. As you can see, with so many things to think about when choosing a new garden fence is a rather daunting prospect, especially if you aren’t sure what you need. So, let’s make the process easier with this helpful buying guide where we’ll outline everything you need to know to choose the option for your needs. Why You Need the Fence? Now, this may seem like an obvious question because most gardens have a fence, but we are referencing the main purpose beyond creating a perimeter for an outdoor space. For example, does your fence serve any security purposes such as keeping out animals, keeping kids safe and secure, offering improved security at potential weak spots around your garden? Thinking about why you need the fence lets you choose a suitable type of fencing for what you need. For example, if you want to improve privacy in your garden then tall panels with little to no spacing is a great option - going for a 6ft fence would significantly improve privacy. Those going for decorative fencing may prefer something lower in height and in a style that compliments the exterior of their property, while anyone that wants to keep pets safe in their garden should be should choose one high enough so they can’t jump over and with narrow panels to avoid squeezing through. Where is the Fence Being Installed? An important consideration to make when buying a garden fence is its location. This is usually impacted by the function of the fence as well, while it will also influence the style options that are available. For example, front gardens tend to feature lower fences that are more decorative. Panels are usually not as high as those found in back gardens, while you may not even want large panels to block out the view. Also, think about the weather conditions in the location of the fence. Windier climates may require sturdy fences with thicker posts, while the those being installed on slopes require different installation methods that may trickier. There are various size options for garden fences so its important to consider the overall dimensions of a new fence. Fence heights range from anywhere between 1ft (0.3m) and 6ft (1.83m), while it’s possible to go above 6ft, although you may need planning permission for this. Fence widths are available in similar measurements (typically between 1ft and 6ft), so when you’re shopping for one it will likely be sold in panels measuring height by width (e.g. 6ft x 6ft) - most clearly state this anyway. Small panels are usually between 1ft and 4ft while larger heights are 4ft to 6ft and above, so the more privacy or security you require the more height you should go for, as this makes trespassing very difficult due to the height they need to climb. Decorative panels are often smaller in size and usually feature decorative toppings, such as a trellis, and while they aren’t the best for security they do offer a pleasant aesthetic. Mid-range sizes offer a happy medium between small and large fences, offering decent security and privacy with some nice design options. Widths are less important as they are generally chosen based on the size and shape of the garden. For instance, if you want a tall fence but have a narrower garden then you won’t need as much width, while larger spaces benefit from more width to cover the entire area in as few panels as possible. There are countless materials used for garden fences, most of them being a type of wood, but not all of these are created equally. For example, cheaper wooden panels are often composite woods that offer a cost-effective solution but aren’t the most durable, with the weather taking its toll on them after a few years. Also, the type of material impacts the aesthetic of the fence too. Hard woods offer a beautiful finish and are also much more durable against the elements, making them a great choice. They may cost more but because they last much longer they often save you more money over the long term. The lifespan of an average garden fence is about ten years, but if you invest in quality materials you double or triple this, saving a fair amount of money at the same time. You’ll also need to spend less time maintaining the fence if the materials are good quality, so be sure to choose wisely! Cheaper materials are still useful however, especially for temporary fencing or to cover smaller areas. 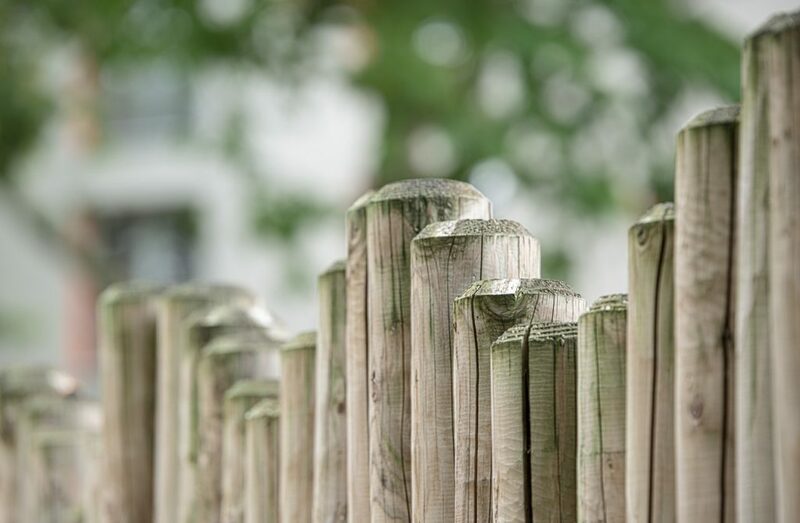 They may need repaired from time to time, but if you don’t mind the work it’s often better to save on your fencing, especially if aesthetics isn’t your focus. Read our guide on choosing a shed for your garden here.